Battersea Park Fireworks is less than a week away! The countdown is on for Wandsworth Council’s Battersea Park Fireworks display. With less than a week to go, tickets are selling fast, buy yours today to avoid disappointment! 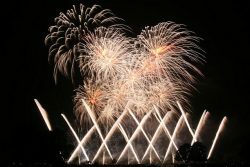 50,000 people are expected to attend this Saturday’s spectacular annual display at Battersea Park, with Jubilee Fireworks providing a magnificent pyrotechnic display. Set to music made by legends, the display will be an impressive combination of all your favourite musical legends – hosted once again by the entertaining TV and Virgin Radio presenter, Christian Williams. The gates, bar, and food stalls open at 6pm, the bonfire will be lit by the Worshipful the Mayor of Wandsworth Councillor Field, at 7.30pm followed by the fireworks at 8pm. There will be no admittance to the park after 8pm. This year there are more food stalls than ever including; churros, pulled pork burgers, German sausages, baked potatoes and lots more. The ever popular bars will be well stocked with mulled wine and other alcoholic refreshments. For those of you who want to avoid the queues in the main arena, pop along to Battersea locals, Butcher and Grill, who will be serving delicious hot food in Rosery car park near to Rosery gate. (There are no cash points in the park so we advise you bring cash). The Wandsworth Group of Rotary Clubs; Tooting, Putney, Battersea, Balham, and Battersea Park will be collecting donations on the evening to support their chosen charities. Donations support the Christmas lunch for the elderly held in Battersea Park on Christmas day and also go towards the Mayor’s charities; Shooting Star Chase – Children’s Hospice Care and CCHF – All about kid’s, you can also donate online today. In the interests of safety, visitors must not bring their own sparklers or fireworks to the display and should leave pets at home. Alcohol for personal consumption is permitted, but no glass please – bag searches will be in place. When travelling to Battersea Park, it is strongly advised that you use public transport and plan your route in advance, visit TfL, Southern Railway, and South West Trains to plan your journey. Do not travel by car as there is no parking available in Battersea Park or in the surrounding streets during the event. The gates get very busy as we get closer to show time so please ensure you enter the park in plenty of time before 8pm. 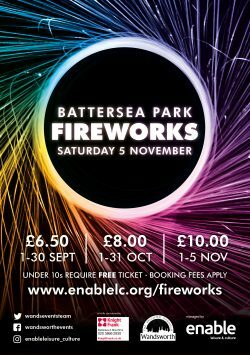 More details are available at www.enablelc.org/fireworks or stay updated on twitter @Wandseventsteam or on the Battersea Park Events Facebook page. Wandsworth Council’s Battersea Park fireworks display is managed and delivered by Enable’s Events Team and proudly sponsored by Knight Frank Battersea and Nine Elms office. All gates are accessible. The designated disabled access route is via Alexandra Gate, Prince of Wales Drive. There is a disabled viewing platform in front of the all weather pitch in the main arena, the closest gate is Alexandra Gate. Accessible toilets are available throughout the event. Free tickets are given to carers when purchasing a disabled ticket. If you have any questions about accessibility or the facilities for disabled visitors, please contact us events@enablelc.org.